Birds of the same Feather..
Photo was taken while we were on the intersection waiting for the red light to turn green. I was browsing my old posts when I just started blogging and I found this one and thought of reposting it. This was original posted on July 21, 2008 when we were still living in S. Korea. My daughter Rylie love chewing gum. The other day we went to the store and as my husband was paying at the counter, Rylie slid a roll of chewing gum in front of her Dad. She was so sleak.. The cashier laughed to her gesture. When we arrived home, she immediately opened it and stuck the whole thing in her mouth. Me and my husband were laughing but at the same time concerned that she might choke on it. Well, I think that she got tired of chewing it that she fell asleep. I tried taking it out but she resisted so we just let her took her nap with the gum inside her mouth. My husband went to the bedrom to check on her and he came back and told me "where's the camera?" I said "why?". He said "I have to take this awesome pose". And here it is: Poor little thing! It's gloomy and it's raining here today , which brings back memories to one of the posts I've made more than three years ago. Our little man is so small on this picture. How do you feel when it's raining? I don't like rainy days, they always make me feel kind of sad. Today is one of those boring days, the rain started last night and it's already 5 o'clock in the afternoon now and it still pouring.. My kiddos can't go outside so all they can do is make a mess around the house. Gosh, drives me nuts! 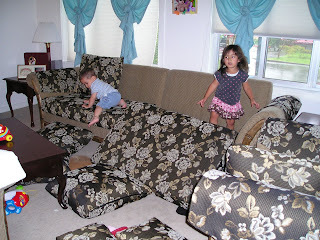 It's hard to keep the house organized when you have makukulit ones. Well, all we can do is just enjoy the moment. On Holy Saturday of Easter, we decided to do a little trekking at the nearby woods. The four of us love doing this kind of stuff. It's a great bonding and a good opportunity for the kids to see things in the nature. We climb down and up the hill in order for us to see the lake. I was proud of how our Burritos could climb the steep hill without complaining. This is the lake that they call "Car Lake" because of some car parts that were in the lake. We went around the hill and looked down the lake at a different angle atop the steep hill. As we came out the woods, we saw four big deer running away from us. Couldn't take a photo as they were fast! It was a fun and memorable way of us in celebrating the Holy Saturday. I am not exactly sure what this feature is called but my burritos called it Tiki Tiki lol. These shots were taken at Magic Kingdom of Disney World. Those are the things that will appear on top of the water when you steer the steering wheels. Connect with me with your favorite color through Color Connection.